Government IT leaders can serve as “trailblazers” for their agencies by leveraging simplified, cloud-based service enhancements as stepping stones to a longer-term modernization journey, a new report suggests. Citing federal agency success stories, the report highlights how commercially available technologies, such as software-as-a-service (SaaS), can bring service improvements that help agencies modernize applications quickly. 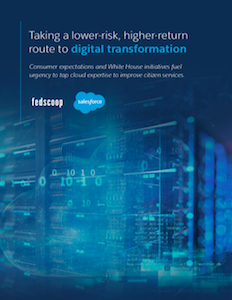 The report, “Taking a lower-risk, higher-return route to digital transformation,” produced by FedScoop and sponsored by Salesforce, also points to the significant reduction in total cost of operations agencies can realize by looking at digital transformation as a journey. The report describes the success of the U.S. Department of Agriculture in using a SaaS solution to consolidate and move mission-focused services to the cloud. After consolidating or retiring some of its apps, the agency was able to use a cloud-based solution to improve how farmers get helpful information. The report references a study which shows how SaaS solutions typically cut enterprise IT expenditures by as much as 50 percent over five years. But because government agency spend is approved only one year at a time, the report stresses the need for IT trailblazers to secure buy-in from their agency’s leaders for long-term goals. This perennial challenge to secure buy-in from executives isn’t easy to overcome. Even though IT trailblazers understand the benefits of moving to the cloud, decision-makers may decide to maintain the systems they already have due to, among other concerns, budgeting issues or lack of skilled staff. That buy-in should come more easily today, the report suggests, in part because of White House initiatives to prioritize IT modernization. The administration has come out in support of agencies moving to cloud-based software services that put the burden of maintaining hardware and software on the SaaS provider and bypassing the recurring costs of infrastructure upgrades, integrations and patching. The report notes the success Amtrak had consolidating applications with a SaaS provider, which opened the door for innovation and led to the rapid development of an application which more effectively tracks train servicing from start to finish. Part of Amtrak’s success resulted from working with a well-established cloud provider with a well-established track record of migrating large-scale enterprise systems to the cloud. A provider’s experience and expertise are especially valuable when in-house knowledge and capabilities are limited, concludes Tatum. Read more about how agencies can get the most from their digital transformation journey by partnering with experienced SaaS providers.